Home › Baja California › Gorge Waves: Nuke and Puke mode. Gorge Waves: Nuke and Puke mode. but some times they are over the top gusty…Why? Take a look at the forecast for yesterday Aug. 2, 2016 to the right. Exactly what does the forecast mean when it talks about strong wind aloft, turbulence, waves and gusty UP AND DOWN winds? And how should you use this information to pick a launch site? First let’s look at the strong winds aloft variable in the first animation. Starts by looking at the surface winds on August 2. Notice how they are focused in the eastern Gorge and appear much lighter in the corridor despite the strong pressure gradient. Why are the winds so strong out east? Watch the animation as we jump from 5000 feet to 10,000 to 18,000 feet. You can see that there is an upper level low pressure centered over the Seattle region. down motion in the wind motion aloft. You can see this in the crude wind tunnel animation that I produced on my Ipad. 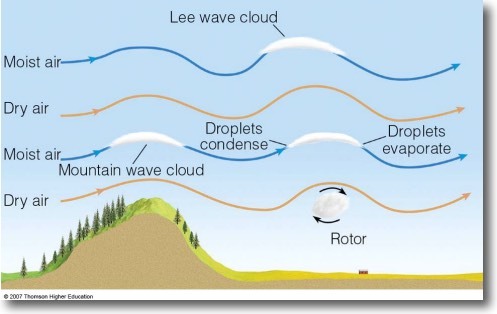 Notice how the winds aloft form ripples and rotors in the lee of the Cascades. If you look very carefully you can see how these waves in the upper air are causing the surface wind to pump up and down. Why? Because the when the upper level winds in the downward portion of a wave comes closer to the surface it can transfer momentum to the surface pressure gradient wind. You experience this as a blast much stronger than the pressure gradient wind. How strong this transfer of momentum works is determined by the stability of the surface air. Generally in areas where the marine layer is absent and the land is heating the surface air is unstable. So you have the maximum blasts if there are strong waves above you. Then when the air in a wave moves upward away from the surface it stops transferring momentum and you experience a deep lull in the pressure gradient surface winds. You are now in Nuke and Puke mode. If the waves aloft are moving very slowly This means you will have long periods of very strong wind that suddenly dies. You can see that in the Swell City and Dougs wind graphs to the right. Since the land is heating more as the day passes the transfer of momentum is unreliable so you are also going to see short term severe up and down conditions which you also see in the Swell and Dougs wind graphs. Notice that the entire time that the wind at Dougs and Swell are crazy up and down the pressure gradients being remarkably steady. So think of the pressure gradient wind as a steady wind with the waves superimposing a huge gust factor. At this point you may be thinking “why are the winds at Stevenson relatively steady?” The answer is that Stevenson is within the Cascades so it is mostly west of the turbulence zone. Now look at the black arrows I have added to all the wind graphs. 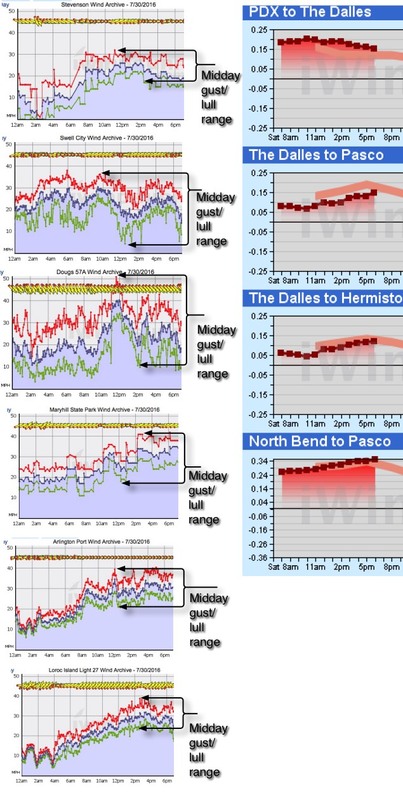 These show the range gust lull range during the mid afternoon. Can you se a pattern as you go from Swell to 3 Mile (Loroc Island)? The further away a site is from the Cascades the less pronounced the up and down factor from the waves becomes. At the same time Swell City had crazy Nuke and Puke winds 3 mile had fairly steady winds. Now let’s go back and study these waves more carefully. Notice the wave clouds in this graphic. Often the waves are invisible to the eye so in our forecasts we have to infer their presence although we get hints since there are air flight warnings posted when these waves are likely. But sometime when there is a deep marine layer and with dry air aloft you can actually see the waves in the satellite imagery and even just looking carefully at the sky. Looking at the image you can see that water vapor in the strong winds aloft is carried upward by the wave motion. Since the air is cooler higher up the vapor condenses into droplets and a visible cloud forms. Then as the droplets descend in the wave the droplets evaporate and the cloud fades away. Since this process is constantly occurring it appears the wave cloud barely moves despite the high velocity wind going through the wave pattern. This phenomenon gives us a useful forecast tool. We can look at the satellite imagery and get a hint of the up and down factor. To the left is a satellite animation from yesterday Aug. 2. This was a day where The Hatch to The Wall zone had crazy up and down winds once the Gorge started heating. Looking at the satellite animation you can see the upper low pressure spinning over Seattle. Note how the the marine layer clouds push way inland to the crest of the Cascades. But focus your attention on the pronounced wave clouds that start over the corridor and then past Dougs. Remember you can only see the wave clouds when the air is moist. So they seem to disappear past Dougs but the reality is that the drier air out east evaporates the cloud droplets but the waves continue eastward. But since the waves are further from the Cascades they are much weaker. That is why folk who left The Wall and went to Roosevelt or 3 Mile found just normal Gorge gusty winds. Let’s take closer look at these wave clouds yesterday. Looking at the satellite animation to the right notice how fast the normal clouds over the pacific are moving. 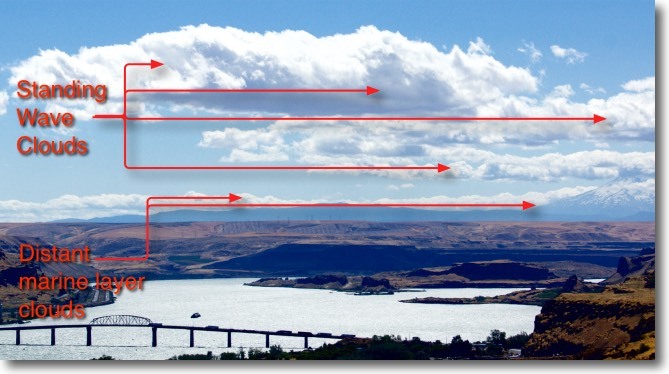 Now notice how the wave clouds over The Dalles barely appear to be moving even though there is high speed wind moving through them. This is due to the clouds constantly forming on the west edge of each cloud and evaporating on the east edge of each cloud. Now notice how the wave clouds seem to disappear over the near eastern gorge past Dougs. Remember that the waves are still there impacting the surface wind but with the water in vapor form you can not see them. But the waves are smaller and their impact on the surface pressure gradient wind is weaker so the wind way out east was steadier. Lastly here is a photo I took from near The Wall yesterday Aug 2. I have labeled the breaking apart wave clouds as well as the distant marine layer clouds. I was at The Wall for several hours in the afternoon and the clouds you see in this picture appeared to barely move in that time. But looking at the water with alternating near calm to major blasts I could tell that there were waves above. I really regret that I did not have my camera that day about 5 years ago when a fire near Biggs allowed us to actually see the waves in the smoke coming over the river.